I remember my first trip to the card store when I was a kid. Not soon after I played a few games of Magic with my friend, I decide to buy my first packs. If I remember correctly, it was a Revised Edition starter pack (back when they HAD starter packs) and a few boosters of Fallen Empires. I won’t be able to tell you what cards I got, but I do have a distinct memory of that place. It was a mom and pop store at a place called North Village Mall, a local, dinky mall (before the super malls we have now) not too far from the Michigan border in northern Indiana. The store wasn’t just for cards, but also for other collectibles such as coins and what not. The couple that ran this place were heavy smokers, in their late 50s, and the smell is probably what you would imagine your grandparents house to smell like if they smoked. The decor would probably be the same at your grandparents house as well ^_^. The point being, it wasn’t really a place for kids, or didn’t seem like it at the time, but I always went there. 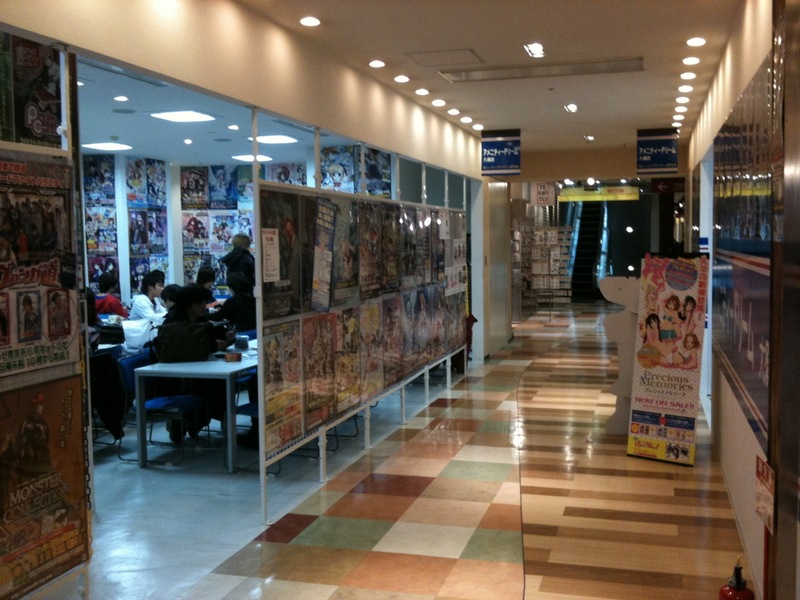 Now, I’m not saying that some places in Japan aren’t like that (each place is still a nerd haven, some with a stronger “smell” than others), but the set up, design, and lighting is much different than anything I had encountered in the USA. The first stop in my hobby shops around Japan profiles is Amenity Dream. Amenity dream is located in Nagoya, Aichi prefecture. From Nagoya station, take the Higashiyama subway line and transfer at Fushimi to the Tsurmai line towards Osu Kannon. The easiest way to get there is from Kamimaezu station. Once at street level, walk back towards Sakae until you see a Starbucks on your left side (about a 10 minute walk). Not too much farther is the Osu 101 Building. Walk right inside and take the elevator to the 2nd floor, and once out of the elevator follow the hallway past all the stores until you get to Amenity Dream, which is identified by it’s Blue and white paint on the walls. Amenity Dream is one of the best shops in downtown Nagoya. They have a large selection of cards, some of the best prices of booster packs in the city (but they only sell recent expansion sets, nothing older than the Zendikar block. They might have a few old sets, but I haven’t seen them yet) , well organized sections of various playing cards, and a large space for card gaming just across the hall. It’s not only Magic cards, but other tradable card games as well. Amenity Dream also offers fair prices for single cards you might want to sell for cash. It’s always smart to shop around at a few other places before deciding to sell your cards, but AD will give you some of the highest amounts for cards next to Big Magic (which will be discussed later). The price of buying single cards isn’t bad either. Not the cheapest, but not the most expensive either. They also have a wide variety of products that people can use for their cards such as boxes and protectors. Next I want to talk about tournaments at Amenity Dream. Starting in December they will have Friday Night Magic every week (check the store for details). AD also hosts regional and qualifying tournaments from time to time, but for those dates it is better to check Wizards of the Coast’s website for game dates in Nagoya. If you’d like to call the store and talk to one of the staff, you can call them at 052-265-8848. Keep in mind they speak mostly Japanese. If you want to sell cards at Amenity Dream, here’s some information. They buy both current Standard play cards, as well as older cards. There is a list on the left wall of the the counter (not the main counter, but the one off to the side) where you can see their current “buy” prices. Most of the cards they are buying are rares or mythic rares, but occasionally they will buy commons and uncommons depending on their popularity at the time. One of their Magic staff has decent English, so you might not have a problem telling them you want to sell cards. As with any store you sell to, be sure to bring an ID. This can be a foreigner card, a Driver’s License, and even your passport. Even if you’re just visiting the area on vacation from overseas, it wouldn’t hurt to see if you can make some extra cash. You might make a nice profit with the Japanese yen being so strong right now! Don’t know Japanese? Say this “Card oh ooritai (I want to sell cards). “Card oh Miite kudasai!” (please look at my cards). Good luck selling! 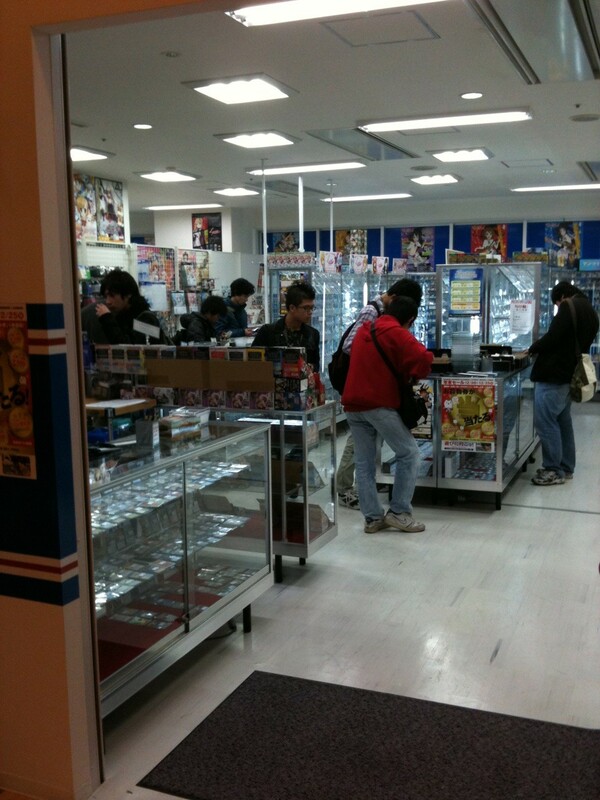 Those are the basics of the first store in my tour of hobby shops in Nagoya. In the future I will be profiling Big Magic, another Magic based focused store only a few blocks down the street from Amenity Dream. I will be focusing on just the basics about the store: what products it offers, the price of boosters, tournaments and events, sell/buy prices, and anything else people are interested in learning about. Thanks again for reading, and if there are any other topics you’d like me to cover in the future, please let me know and I will be sure to add them into my continuing posts about Magic/Hobby shops in Japan. At least I can’t find them in their respective web sites. Do you happen to know any email address for those two shops? They’d be very much appreciated! If you mean their web addresses, I can supply them. I believe if you type in “Nagoya” in the store locator function on Wizards of the Coast’s website, you can find emails for the stores, but keep in mind that you’ll most likely be talking to a Japanese person in charge of Magic at that store and that they probably won’t speak much English. The websites for the stores will also be for their chain as a whole, so you’ll have to click around to find a specific store (such as one in Nagoya). If you don’t mind being a little patient, I will eventually add in the web addresses and phone numbers, but I’m currently swamped by work and in the middle of writing articles, so it might not be until after the World Magic Cup Qualifiers and PTQ here. http://amenitydream.co.jp/shop/aichi-osu/ is the website for the Nagoya Amenity Dream store, but it doesn’t have much info about it. The main website can be found at http://amenitydream.co.jp/. Big Magic Nagoya’s website is http://www.bigmagic.net/nagoya.htm and their main site is http://www.bigmagic.net/index.html. Hope that helps. I got most of this info off of WotC store locator for Nagoya. I actually meant their email addresses. I had already found their websites and surfed them, but couldn’t find any emails where I could send an inquiry to. That should be on Wizards locator. Just type the name of the city you want to look in and click on the store, and most places will have an email you can send questions to. Would you have the street addresses of the various trading card game shops e.g. Hobby Station, Yellow Submarine, Big Magic, Amenity Dream, etc in Nagoya?